A century ago, Oklahoma had the strongest socialist movement in the US. Today, there are signs it's being reborn. Mass struggle has a remarkable way of puncturing political myths. Liberals for many years have condescendingly portrayed working people in “red states” like West Virginia and Oklahoma as brainwashed dupes of the Republicans. But the eruption of teachers’ rebellions across so-called Trump country has revealed the superficiality of these accounts. By ignoring social class and class struggle, the “red state” myth misread the present — and distorted the past. All regions of this country have rich, and relevant, traditions of labor resistance. Educators in West Virginia reclaimed this history when they surged into struggle, obliging mainstream accounts of the strike to highlight precedent-setting historical struggles like the Mine Wars. But it’s significant that the liberal media has so far studiously ignored Oklahoma’s deep history of militancy. Part of the reason for this discrepancy is that there is more working-class political continuity in West Virginia than in the Sooner State. But there’s an additional reason: Oklahoma’s radical roots are explicitly socialist. It’s a little-known fact that Oklahoma had the strongest Socialist Party in the country a century ago. Angered by their material hardships and inspired by a vision of economic and political democracy, tens of thousands turned to socialism. For a growing group of young Oklahomans inspired by the Bernie Sanders campaign, this isn’t ancient history. Over the past two years, they have reclaimed the experience of Red Oklahoma and they have revived a socialist movement across the state. This new generation of radicals confronts many of the same dilemmas as their predecessors. Yet one challenge particularly stands out: how to begin building roots in unions and workplaces. Without a base in the labor movement, Oklahoma’s socialists have been unable to help guide the current education strike to victory. The starting point for the emergence and popularity of Oklahoma socialism was the dire economic situation of working people across the state. Small-holding and tenant farmers were subjected to intense profit-squeezing by large landowners and credit-lenders. Failing to make ends meet, many ended up deeply in debt, obliging them to work land that they didn’t own. Brutal poverty, the concentration of land ownership in the hands of a small elite, and the exploitative credit-lending power of the banks were an explosive mix. By consistently championing the basic material demands of Oklahomans for land and economic justice, and by treating poor farmers as part of a broadly conceived working class, socialists from 1902 onward began building up a popular base in the Sooner State. Oklahoma’s Socialist Party (SP) soon became the party’s largest branch, per capita, in the United States. Much of the credit for this growth can be given to the tireless work of German-born socialist Oscar Ameringer. A talented and humorous propagandist known as the “Mark Twain of American Socialism,” Ameringer built up a strong organizational and electoral apparatus inspired by Milwaukee’s moderate socialist machine. Contesting elections was a central means through which the SP rooted itself among Oklahoman toilers. This electoral focus was particularly important since Oklahoma lacked a large industrial working class with the social power to shut down production through strikes. By 1914, the SP had over eight hundred locals and over 175 elected officials, including six state legislators. That year, the party’s gubernatorial candidate, Fred W. Holt, got 20 percent of the vote, convincing both the poor and the political elite that Oklahoma’s socialists might soon win the levers of governmental power. Though electoral politics was a central focus, the Socialist Party hardly limited itself to this arena. Holt, for instance, was imprisoned for six months in 1915 for giving arms to striking mine workers in Macalester. A more typical form of socialist activity was the promotion of the party press. More copies of the national journal Appeal to Reason were sold in Oklahoma than elsewhere in the US. Branches in towns across Oklahoma established their own newspapers and distributed a wide variety of educational pamphlets. Of these, the most popular was Ameringer’s 1909 The Life and Deeds of Uncle Sam. A Little History for Big Children, a witty popularized socialist account of US history, sold half a million copies before World War I. More than elsewhere in the country, Oklahoma’s socialists found creative ways to blend socialism with preexisting cultural norms and political traditions. One important example of this was the SP’s focus on organizing encampments, a practice pioneered by evangelicals and Populists. Thousands of farmers would travel by covered wagon for a week of singing, socializing, discussing, and socialist education. “It makes one think of an old-fashioned Methodist camp meeting,” reported one local activist in 1903. “Singing and speeches, interest and excitement ran so high that the event lasts until about one o’clock in the night.” In 1915 alone, there were over two hundred encampments, some of which numbered up to ten thousand participants each. The means to the end is the class struggle, but the goal itself is the abolition of classes and class wars though the establishment of the common ownership of the means of production. The place of the present industrial monarchy will be taken by the industrial democracy of the future, the Socialist Republic. This position — not an easy one to take in a deeply white supremacist society — did not merely remain on paper. As Bissett notes, the “Socialist Party was the most hospitable political institution available for black Oklahomans in the early twentieth century.” Most importantly, the SP led a historic struggle in 1910 against the Democratic Party’s “grandfather clause” ballot initiative to electorally disenfranchise black residents. Ameringer wrote the ballot argument against the measure and the party campaigned hard to stop it, despite the fact that everybody knew that this would cost the SP votes by alienating racist white workers. Therefore, Be It Resolved, that we hereby endorse the platforms put out by our Socialist brothers and recommend that all the colored people of Oklahoma vote the Socialist ticket and align themselves with our Socialistic brethren. Further evidence of the SP’s Marxist credentials was its principled opposition to imperialist war. In 1914, the party declared that “if war is declared [by the US government], the socialists of Oklahoma shall refuse to enlist; but if forced to enter military service to murder fellow workers, we shall choose to die fighting the enemies of humanity within our own ranks rather than to perish fighting our fellow workers.” Along these lines, the SP fought in 1916 and early 1917 against the US military intervention in Mexico to fight Mexican revolutionary Pancho Villa. It was the SP’s steadfast struggle against capitalist war that eventually led to the party’s demise. In April 1917, Democratic president Woodrow Wilson declared war on Germany, reversing his recent campaign promises to keep the US out of the European conflict. In subsequent weeks and months, vigilante and state harassment thinned the ranks of Oklahoman socialism. For their “disloyalty,” socialist newspapers were closed down. The blessings of US democracy have always been unevenly guaranteed for radicals, particularly in times of war. Government persecution intensified after the August 1917 “Green Corn Rebellion,” a failed armed uprising begun by a biracial group of Oklahoman tenant farmers to oppose World War I and the draft. After Oklahoma’s state leaders falsely accused the Socialist Party of having orchestrated the rebellion, socialists across the state were subjected to intense persecution. Many were arrested, fired from their jobs, flogged, or even tarred and feathered. The repression worked. By 1918, Oklahoma’s mass socialist movement had been destroyed by the state. Seeking a complete eradication of the socialist legacy, government leaders in 1925 replaced Oklahoma’s red state flag because it was too associated with working-class radicalism. Bernie showed how radical Oklahoma was under the surface. Those rallies when he came really inspired and electrified people. He won the Democratic primary by a huge margin — and he gave an outlet to the deep dissatisfaction that existed with the status quo. People who had been isolated now felt confident and mobilized. Learning about Oklahoma’s radical history was a huge defining factor for me: it gave me something to be proud of. I’ve spent a lot of my life trying to get away from here, but now I’m doing the opposite. I recognize that if those of us leave who can make a change, then nothing will ever happen. Our red history is a reason to stay in Oklahoma, to reclaim a legacy. Socialists are, of course, still a small minority. As important as the Sanders campaign was in Oklahoma, decades of resignation and accumulated political baggage did not disappear overnight. A large number of Oklahoma’s Bernie voters were Republicans — and the same is true for teachers and staff currently on strike. Liberals and leftists would do well to digest this fact. It shows the potential to cohere a majoritarian working-class movement in all US states, while simultaneously underscoring that this will require a great deal of political patience regarding the uneven development of our coworkers’ consciousness. Looking at Oklahoma’s election results isn’t a very good indicator of ordinary people’s politics because the Democratic Party is bought by massive international corporations just as much as the Republicans. Here in Oklahoma, politics is really more about top and bottom than it is about Right and Left. How to confront the Democratic Party will certainly be one of the major challenges for Oklahoma’s fledgling socialist movement. Like the Socialist Party of a century ago, DSA chapters are extremely critical of the Democrats. Yet unlike their political antecedents, socialists these days not infrequently support left-wing Democratic candidates. This is understandable, since the current movement arose out of Bernie Sanders’s fight for the Democratic Party’s presidential nomination. Yet it’s worth remembering which party killed socialism in Oklahoma. Though co-optation is more of a threat today than repression, the success of the emerging labor radicalization in Oklahoma, West Virginia, and beyond will likely depend on its ability to break free of Democratic Party tutelage. The religious thing is still huge. It’s not as a big among young people; millennials here are also less religious. This is an opening, but it’s also a challenge. Since a lot of Oklahoman activists aren’t religious, it means that we’re not usually well-connected to the churches. This sometimes makes it hard to build roots in the community, particularly in rural areas, where the church is really the main community institution. Racism remains a big issue, but there are also generational divides. Younger people are less inclined to be ideologically racist in the more overt sense, but racist ideas of course are still widespread. That said, I remain convinced that people are changed through struggle. The softer forms of racism can be resolved through struggle and solidarity; the more hardened racists will have to be isolated. If you come around socialist organizations, there’s a lot of white males. It’s real. But I don’t agree when people say that “socialism is a white people thing.” I’m from Ecuador, and I’ve always been a socialist. Our president, Rafael Correa, influenced me to fight against the status quo and for workers’ rights. So the current composition of US socialism isn’t inevitable: we need to work more on bringing in other folks to the organization and to make sure not only that their voices are heard, but that they become organizers as well. Today’s socialists face some opportunities unknown to their rural-based SP predecessors. Unlike a century ago, Oklahoma now has a large urban working class. Unfortunately, Oklahoma’s socialists have not yet built a base in workplaces or the labor movement. This constitutes a major difference with West Virginia, where key strike leaders were young socialists with deep roots in their school sites and unions. Without any members working in the schools, Oklahoma’s socialists have been limited to providing outside support to the education strike. And while providing solidarity for working-class struggles is obviously essential, it’s not the same as providing leadership. One can’t help but wonder how Oklahoma’s education movement would have developed had there existed a core of organized militants capable of providing it guidance. Though small in numbers, West Virginian socialists were instrumental in articulating political demands, in pushing their unions forward, and in building school-site power before and during the strike. 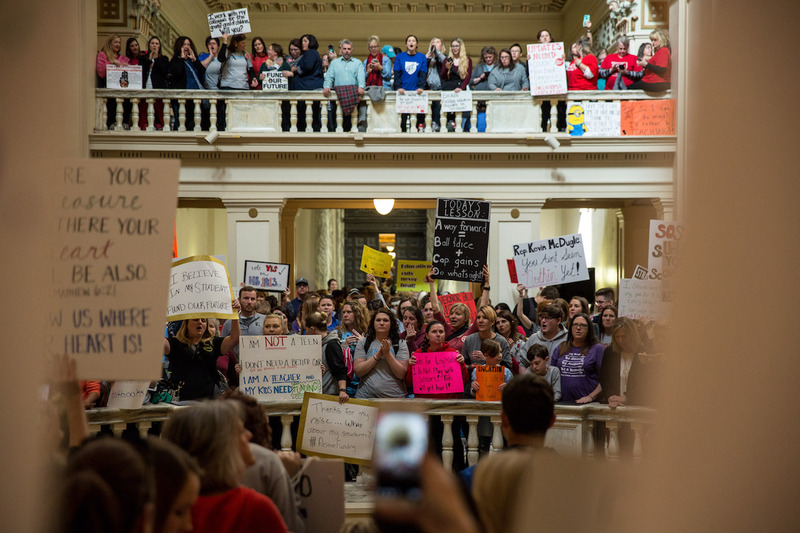 In contrast, Oklahoma’s inexperienced rank-and-file activists have punted on big political questions, over-relied on Facebook, and neglected to prepare for the strike through a series of escalating build-up actions. I may be very optimistic, but I think we’ve entered a new historic period after the Bernie Sanders campaign and now these strikes. There is a new working-class political pole — and people, even those who are not on the Left, are becoming very receptive to it. To improve people’s living and working conditions urgently requires major challenges to the system. And that can’t be brought by the mainstream. We have the momentum, it’s just a matter of getting organized. Of course, effectively organizing isn’t easy for a young group like us. But we can see the opportunities. Ordinary people aren’t dumb, they just need to see an alternative.